I love reading about inspirational small businesses, so I thought we might follow the story of Lola's Ice Cream truck with another built-by-hand establishment - The Big Sur Bakery. The Big Sur Bakery sits back off California's famous Highway 1 a bit, nestled next to a gas station. It's owners, three of them, abandoned the Los Angeles restaurant scene years ago, determined to turn a property with a lackluster track record into something special. 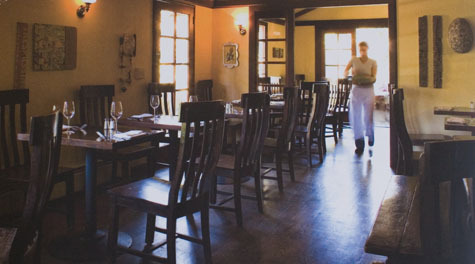 They set their sights on a house-turned-abandoned-restaurant, eventually wrangling it into what is now the beloved Big Sur Bakery. It was tough choosing just one recipe to feature from their newly released cookbook, but a seed-packed pocket bread contributed by a good friend of the bakery jumped out at me. Sesame, sunflower, flax and poppy seeds, millet, oat bran, and a bit of beer impressively cram themselves into palm-sized hearty rolls in a way that doesn't disappoint. The cookbook captures a year in the life of the restaurant through a series of vignettes, purveyor profiles, and recipes. Anyone who dreams of starting their own restaurant should have a read. One of the things I like about this book, is the way it portrays many of the things that make creating a restaurant so fulfilling. At the same time it isn't afraid to touch on some of the stuff that also makes it drop-dead difficult. As I'm sure many of you know (or can imagine) Big Sur is remote, and running any sort of business in a town connected by a single power line to Carmel isn't without its challenges. I've only been to the bakery once, mid-morning for a coffee as Wayne and I made our way north after a weekend get-away. I loved the dark wood, the beautifully rustic morning pastries, and mix of locals and people just-traveling-through intersecting at the counter. The bakery serves coffee and pastries in the morning and early afternoon, lunch on certain days, as well as dinner (hours listed here). The heart of the bakery is the wood-fired stove - and much of the food served (and featured in the cookbook) is inspired by it. The book includes a wide range of recipes, not simply pastries and baked treats. Also plenty for vegetarians and non-vegetarians alike. I've earmarked the Dresden Stollen, Nine-Grain Pancakes, Date & Quinoa Muffins, and the Fresh Garbanzo Bean Stew. The talented Sara Remington did the photography for the book - a beautiful combination of portraits, images of Big Sur, meals shared, and of course, no end to the photos of the food. In all, 262 pages, full color. And to finish, a couple more notes about today's bread recipe. It is a recipe from Terry "Hide" Prince, one of the bakery's earliest friends. If you can imagine a dense, seed and grain-packed English muffin, you're in the ballpark. Rather than using salt, Terry gathers kelp from the coast and uses it to season the bread. I used sea salt, but would have used dulse flakes if I had had them on hand. The key to enjoying these delicious little breads (and I can't emphasize this enough), is splitting them open, toasting them until they are deeply golden, then slathering them generously with butter (or drizzling with olive oil). Then sprinkle with a bit more salt. Blissful buttery crunchiness. Breads like these make me wish I had a toaster oven just for convenience sake. I followed the recipe here and used all-purpose flour as the base - there are plenty of other nutritionally-packed ingredients coming into play, and I wanted to see what the personality of the rolls were meant to be. And they were great. That being said, if I were to experiment with a whole grain flour I think I might start with white whole wheat flour or spelt flour - flours with higher protein levels, but not quite as dark and "wheaty" as standard whole wheat flour. I'd suggest giving the recipe a try as written first, and then try experimenting. I bolded the ingredients I chose down below as well. The original recipe calls for 1/2 teaspoon salt, but the next time around I'll use a full teaspoon. Adjust the oven rack to the middle position and preheat the oven to 375F degrees. Line a baking sheet with parchment paper if desired. 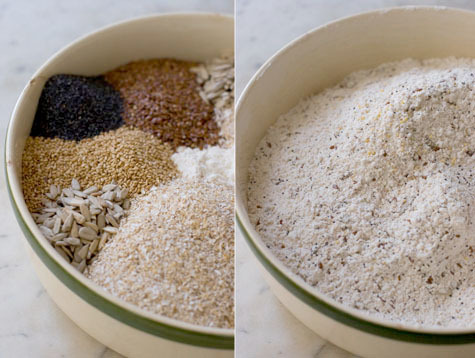 Place all the dry ingredients in an (extra-large) bowl, stir them together, and make a well in the center. Add the beer and the buttermilk. Mix with the handle of a wooden spoon until a thick, wet batter forms. Sprinkle a layer of flour over the top. Turn the batter onto a lightly floured surface and roll it into a loose log about 2 inches in diameter. Cut it into 1 1/2-inch-thick slices and par them down with your hands to form patties. Place the patties on the baking sheet and bake them for 45 minutes, until golden brown. Let them cook completely. To serve, slice each patty in half, toast it well, and smear with butter (hs note: a sprinkling of salt works wonder here as well). And seriously, make sure to toast it. Hide bread is similar to an English muffin in that if you don't toast it, it'll taste raw. Makes about fifteen 4-inch patties.